The United States Bill of Rights consists of the first 10 amendments to the United States Constitution. These amendments limit the powers of the federal government, protecting the rights of all citizens, residents and visitors on United States territory. Among the enumerated rights these amendments guarantee are: the freedoms of speech, press, and religion; the people's right to keep and bear arms; the freedom of assembly; the freedom to petition; and the rights to be free of unreasonable search and seizure; cruel and unusual punishment; and compelled self-incrimination. The Bill of Rights also restricts Congress' power by prohibiting it from making any law respecting establishment of religion and by prohibiting the federal government from depriving any person of life, liberty, or property without due process of law. In criminal cases, it requires indictment by grand jury for any capital or "infamous crime," guarantees a speedy public trial with an impartial and local jury, and prohibits double jeopardy. In addition, the Bill of Rights states that "the enumeration in the Constitution, of certain rights, shall not be construed to deny or disparage others retained by the people," and reserves all powers not granted to the Federal government to the citizenry or States. Image of the United States Bill of Rights from the U.S. National Archives and Records Administration. These amendments went into effect on December 15, 1791, when ratified by three-fourths of the States. Most were applied to the states by a series of decisions applying the due process clause of the Fourteenth Amendment, which was adopted after the American Civil War. The U. S. Bill of Rights represented a major step in the creation of democracy in defining the roles and responsibilities of the government vis-a-vis the citizenry. Initially drafted by James Madison in 1789, the Bill of Rights was written at a time when ideological conflict between Federalists and anti-Federalists, dating from the Philadelphia Convention in 1787, threatened the Constitution's ratification. The Bill was influenced by George Mason's 1776 Virginia Declaration of Rights, the 1689 English Bill of Rights, works of the Age of Enlightenment pertaining to natural rights, and earlier English political documents such as the Magna Carta (1215). The Bill was largely a response to the Constitution's influential opponents, including prominent Founding Fathers, who argued that it failed to protect the basic principles of human liberty. The Bill of Rights plays a central role in American law and government, and remains a fundamental symbol of the freedoms and culture of the nation. One of the original fourteen copies of the Bill of Rights is on public display at the National Archives in Washington, D.C. The original document proposed by Congress to the states actually contained 12 "Articles" of proposed amendment. However, only the third through twelfth articles, corresponding to what became the First through Tenth Amendments to the Constitution, were ratified by the required number of states by 1791. The first Article, dealing with the number and apportionment of members of the House of Representatives, never became part of the Constitution. The second Article, limiting the ability of Congress to increase the salaries of its members, was ratified two centuries later as the 27th Amendment. The term "Bill of Rights" has traditionally meant only the 10 amendments that became part of the Constitution in 1791, and not the first two, which dealt with Congress itself rather than the rights of the people. That traditional usage has continued even since the ratification of the 27th Amendment. The Philadelphia Convention set out to correct weaknesses inherent in the Articles of Confederation that had been apparent even before the American Revolutionary War had been successfully concluded. The newly constituted Federal government included a strong executive branch, a stronger legislative branch and an independent judiciary. "Bills of rights are in their origin, stipulations between kings and their subjects, abridgments of prerogative in favor of privilege, reservations of rights not surrendered to the prince. Such was Magna Charta, obtained by the Barons, sword in hand, from King John." "I go further, and affirm that bills of rights, in the sense and in the extent in which they are contended for, are not only unnecessary in the proposed constitution, but would even be dangerous. They would contain various exceptions to powers which are not granted; and on this very account, would afford a colorable pretext to claim more than were granted. For why declare that things shall not be done which there is no power to do?" On June 5, 1788, Patrick Henry spoke before Virginia's ratification convention in opposition to the Constitution: "Is it necessary for your liberty that you should abandon those great rights by the adoption of this system? Is the relinquishment of the trial by jury and the liberty of the press necessary for your liberty? Will the abandonment of your most sacred rights tend to the security of your liberty? Liberty, the greatest of all earthly blessings—give us that precious jewel, and you may take every thing else!" Main article: Anti-Federalism; See also: Anti-Federalist Papers. "We find they have, in the ninth section of the first article declared, that the writ of habeas corpus shall not be suspended, unless in cases of rebellion—that no bill of attainder, or ex post facto law, shall be passed—that no title of nobility shall be granted by the United States, etc. If every thing which is not given is reserved, what propriety is there in these exceptions? Does this Constitution any where grant the power of suspending the habeas corpus, to make ex post facto laws, pass bills of attainder, or grant titles of nobility? It certainly does not in express terms. The only answer that can be given is, that these are implied in the general powers granted. With equal truth it may be said, that all the powers which the bills of rights guard against the abuse of, are contained or implied in the general ones granted by this Constitution." Yates continued with an implication directed against the Framers: "Ought not a government, vested with such extensive and indefinite authority, to have been restricted by a declaration of rights? It certainly ought. So clear a point is this, that I cannot help suspecting that persons who attempt to persuade people that such reservations were less necessary under this Constitution than under those of the States, are willfully endeavoring to deceive, and to lead you into an absolute state of vassalage." Only after two leading Antifederalists, Adams and Hancock, negotiated a far-reaching compromise did the convention vote for ratification on February 6, 1788 (187–168). Antifederalists had demanded that the Constitution be amended before they would consider it or that amendments be a condition of ratification; Federalists had retorted that it had to be accepted or rejected as it was. Under the Massachusetts compromise, the delegates recommended amendments to be considered by the new Congress, should the Constitution go into effect. The Massachusetts compromise determined the fate of the Constitution, as it permitted delegates with doubts to vote for it in the hope that it would be amended. 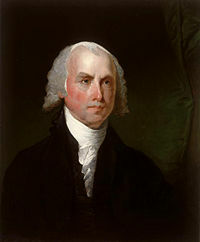 Madison, at the head of the Virginia delegation of the 1st Congress, had opposed a Bill of Rights but hoped to preempt a second Constitutional Convention that might have undone the difficult compromises of 1787: a second convention would open the entire Constitution to reconsideration and could undermine the work he and so many others had done in establishing the structure of the United States Government. Madison based much of the Bill of Rights on George Mason's Virginia Declaration of Rights (1776), which itself had been written with Madison's input. He carefully considered the state amendment recommendations as well. He looked for recommendations shared by many states to avoid controversy and reduce opposition to the ratification of the future amendments. Additionally, Madison's work on the Bill of Rights reflected centuries of English law and philosophy, further modified by the principles of the American Revolution. The English legal tradition included such revolutionary documents as the Magna Carta (1215), protecting the rights of noblemen against the King of England, and the English Bill of Rights (1689), establishing the rights of legislators in Parliament against the power of the sovereign. Concurrently, English philosopher John Locke had argued that all men have inalienable natural rights and that the purpose of government was to protect property rights, ideas that became part of the American view of government. Madison, in the United States Bill of Rights, continued in the radical tradition of the American Revolution by further extending and codifying these rights. 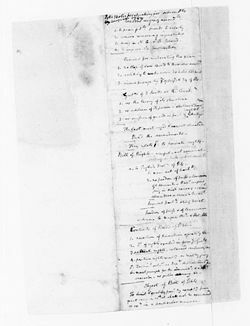 Madison's "Notes for speech on Constitutional amendments, June 8, 1791, in which he underlined the concept of "natural rights retained"
To some degree, the Bill of Rights (and the American Revolution) incorporated the ideas of John Locke, who argued in his 1689 work Two Treatises of Government that civil society was created for the protection of property (Latin proprius, or that which is one's own, meaning "life, liberty, and estate"). Locke also advanced the notion that each individual is free and equal in the state of nature. Locke expounded on the idea of natural rights that are inherent to all individuals, a concept Madison mentioned in his speech presenting the Bill of Rights to the 1st Congress. The government should not have the power of suspending or executing laws, "without consent of the representatives of the people,". A legal defendant has the right to be "confronted with the accusers and witnesses, to call for evidence in his favor, and to a speedy trial by an impartial jury of his vicinage," and may not be "compelled to give evidence against himself." Individuals should be protected against "cruel and unusual punishments", baseless search and seizure, and be guaranteed a trial by jury. The government should not abridge freedom of the press, or freedom of religion ("all men are equally entitled to the free exercise of religion"). The government should be enjoined against maintaining a standing army rather than a "well regulated militia." "For while we feel all these inducements to go into a revisal of the constitution, we must feel for the constitution itself, and make that revisal a moderate one. I should be unwilling to see a door opened for a re-consideration of the whole structure of the government, for a re-consideration of the principles and the substance of the powers given; because I doubt, if such a door was opened, if we should be very likely to stop at that point which would be safe to the government itself: But I do wish to see a door opened to consider, so far as to incorporate those provisions for the security of rights, against which I believe no serious objection has been made by any class of our constituents." 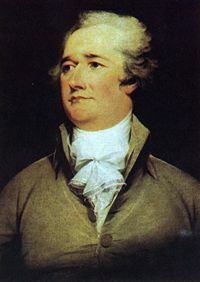 "I believe that the great mass of the people who opposed [the Constitution], disliked it because it did not contain effectual provision against encroachments on particular rights, and those safeguards which they have been long accustomed to have interposed between them and the magistrate who exercised the sovereign power: nor ought we to consider them safe, while a great number of our fellow citizens think these securities necessary." On November 20 1789, New Jersey became the first state to ratify these amendments. 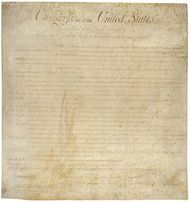 On December 15 1791, ten of these proposals became the First through Tenth Amendments—and United States law—when they were ratified by the Virginia legislature. Articles III to XII were ratified by 11 out of 14 states (greater than 75 percent). Article I, (rejected by Delaware), was ratified only by 10 of 14 States (less than 75 percent), and despite later ratification by Kentucky (11 of 15 states, which would have made the vote less than 75 percent, the article has never since received the approval of enough states for it to become part of the Constitution. Article II was ratified by 6 of 14, later 7 of 15 states, but did not receive the three quarters majority of States needed for ratification until 1992 when it became the 27th Amendment. Lawmakers in Kentucky, which became the 15th state to join the Union in June 1792, ratified the entire set of 12 proposals during that commonwealth's initial month of statehood, perhaps unaware—given the nature of long-distance communications in the 1700s—that Virginia's approval six months earlier had already made 10 of the 12 amendments part of the Constitution. Although ratification made the Bill of Rights effective in 1791, three of the original 13 states—Connecticut, Georgia, and Massachusetts—did not "ratify" the first 10 amendments until 1939, when they were urged to do so in a celebration of the 150th anniversary of their passage by Congress. Originally, the Bill of Rights applied only to the federal government and not to the several state governments. Parts of the amendments initially proposed by Madison that would have limited state governments ("No state shall violate the equal rights of conscience, or the freedom of the press, or the trial by jury in criminal cases.") were not approved by Congress, and therefore the Bill of Rights did not appear to apply to the powers of state governments. Thus, states had established state churches up until the 1820s, and Southern states, beginning in the 1830s, could ban abolitionist literature. In the 1833 case Barron v. Baltimore, the Supreme Court specifically ruled that the Bill of Rights provided "security against the apprehended encroachments of the general government—not against those of local governments." However, in the 1925 judgment on Gitlow v. New York, the Supreme Court ruled that the Fourteenth Amendment, which had been adopted in 1868, made certain applications of the Bill of Rights applicable to the states. The Supreme Court then cited the Gitlow case as precedent for a series of decisions that made most, but not all, of the provisions of the Bill of Rights applicable to the states under the doctrine of selective incorporation. In 1941, President Franklin D. Roosevelt declared December 15 to be "Bill of Rights Day," commemorating the 150th anniversary of the ratification of the Bill of Rights. The Bill of Rights is on display at the National Archives and Records Administration, in the "Rotunda for the Charters of Freedom." The Rotunda itself was constructed in the 1950s and dedicated in 1952 by President Harry S. Truman, who stated: "Only as these documents are reflected in the thoughts and acts of Americans, can they remain symbols of power that can move the world. That power is our faith in human liberty …"
After 50 years, signs of deterioration in the casing were noted, while the documents themselves appeared to be well-preserved: "But if the ink of 1787 was holding its own, the encasements of 1951 were not… minute crystals and microdroplets of liquid were found on surfaces of the two glass sheets over each document…. The CMS scans confirmed evidence of progressive glass deterioration, which was a major impetus in deciding to re-encase the Charters of Freedom." Accordingly, the casing was updated and the Rotunda rededicated on September 17, 2003. In his dedicatory remarks, 216 years after the close of the Constitutional Convention, President George W. Bush stated, "The true [American] revolution was not to defy one earthly power, but to declare principles that stand above every earthly power—the equality of each person before God, and the responsibility of government to secure the rights of all." In 1991, the Bill of Rights toured the country in honor of its bicentennial, visiting the capitals of all 50 states. ↑ "On the lack of a Bill of Rights," also known as "Anti-Federalist #84" accessdate 2006-02-28. Also see: "The Federalist with Letters of Brutus," edited by Terence Ball, (Cambridge Texts in the History of Political Thought), 447–453. Excerpt from the writings of "Brutus" probably in the New York Journal, November 1, 1787. ↑ Virginia Declaration of Rights.National Archives. Retrieved November 22, 2008. ↑ Article 1, later paraphrased in the opening sentences of the United States Declaration of Independence. Brant, Irving. The Bill of Rights: Its Origin and Meaning. (1965) online versionquestia.com. Kathleen Krull. A Kid's Guide to America's Bill of Rights. Harpercollins Childrens Books, 1999. Spaeth, Harold J. and Edward C. Smith. HarperCollins College Outline: The Constitution of the United States, 13th ed. New York: HarperCollins, 1991. ISBN 0064671054. History of "United States Bill of Rights"